We are continuing our whirlwind month of October with another visit to HSN this week, and wanted to give you the scoop on everything new! 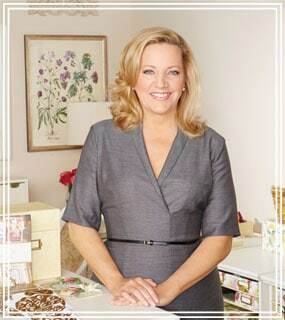 We are debuting brand new assortment of Anna Griffin Home items this Wednesday, October 21st at 7 a.m. and 10 a.m. EST. There’s everything from patchwork to plush, and it’s all giftable for the holiday season. First up are chic sets for the top of the bed featuring prints from two of our favorite collections- Camilla and Juliette. There’s a patchwork quilt and comforter set for Camilla, and a woven jacquard look for Juliette. So beautiful! Next we have everything you need to accessorize these collections with coordinating drapes, bed skirts and decorative pillows. Just like in crafting, we added gorgeous ribbon details and beautiful floral imagery to these pieces so you can embellish your favorite space to your heart’s content! We think lounging around the house should be beautiful in the making too, don’t you? 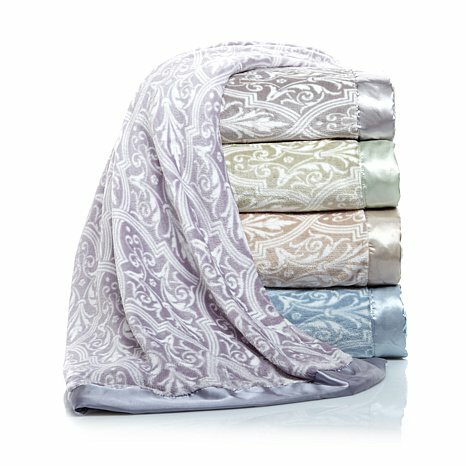 We’re excited to introduce plush throws, slippers and robes in four gorgeous colors from our Camilla collection! There’s even a giftable throw and slipper set that anyone on your list will absolutely love. Would you like to win one of these pretty plush products? Comment below and tell us your favorite new Anna Griffin Home item! We will draw a winner at random on Friday. Click here to visit the Anna Griffin Home store on hsn.com. See you on Wednesday! I think I would be in heaven with those the Camilla plush slippers. Thanks for the opportunity to win a pair. I love it all! 1st item on my list would be the pattern blankets with satin trim. The patterns on all the products are just lovely. I love the patchwork quilt and all the cozy looking items, like the robe, throw, slippers and blanket! It’s too hard to pick just one! I love all things Anna Griffin! Your designs, whether it’s for the home or your paper crafting items, are always beyond beautiful! Everything in the Juliette line is especially beautiful and elegant. Thanks for adding these to the HSN site. I love the robe!!! Pretty and cozy!! The Camilla Collection looks fabulous, but then they all do! Love the steel grey (?) Juliette set so much. It is just gorgeous. And I know it is comfy too!! I love that everything is cotton. I especially love the quilt! 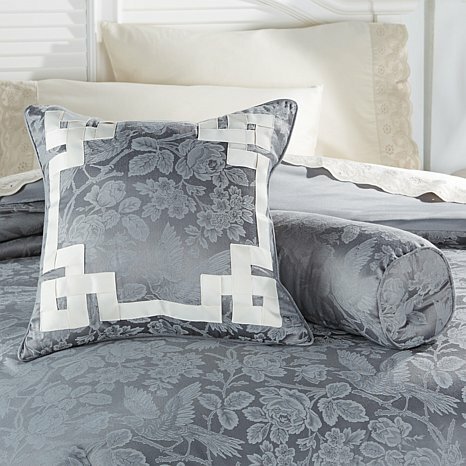 Just love the jacquard Juliette comforter ~ so elegant! All so very pretty !! 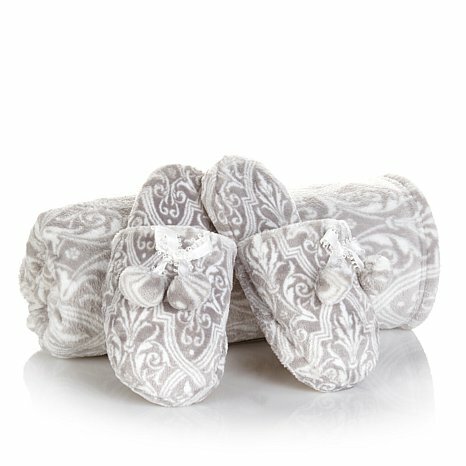 I love the throw and slipper set – will have to get a set for my Mom and each of my sisters! Thank you Anna for making cozy so beautiful! Anna, love the Camilla collection; blankets, slippers, robe; any would be beautiful to lounge around in, thinking of what next Anna card I’m making! Watching you on HSN RIGHT NOW! Beautiful show with wonderful PLUSH! 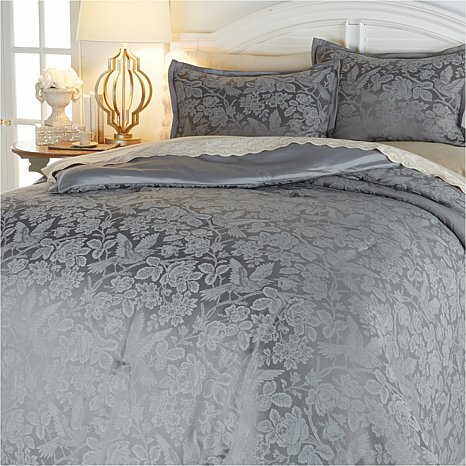 Love the Juliette Jacquard comforter set!! Very beautiful!! I love the new robe! Looks so soft and snuggly! Would love to wear that on a chilly evening along with the slippers! Love the comforters and pillows. My room is in pink and purple and these would be a wonderful addition. I’d love to give or receive the plush robe, slippers and throw! Everything’s beautiful. I would love to win the Camilla patchwork quilt. So nice. Beautiful! Just what I’ve been looking for! And what could be better than lounging in Anna cozy clothes while crafting? I love all of it and will miss you so much here in the UK! I received the Xmas cardstock yesterday, and the box of 120 flowers! Beautiful ! rich & inviting describe this collection and if I could only choose one thing it would be the comforter set! Crossing my fingers & toes!! I like the plush robe and the beautiful Juliette spread.So posh!! Hi Anna. The Camilla bedding is my favorite, I love the floral pattern and the pleated ribbon dust ruffle is beautiful. What else could a girl ask for but to be so cozy in Anna Griffin’s robe and slippers, cuddled up in the matching fluffy throw while laying across the beautiful Camilla bedding, watching Anna Griffin on HSN and calling in her orders for the most beautiful crafting products ever! What a dream! One of those beautiful throws would be the hot ticket to crawl up on my reading chair with as the nights begin to get cooler. Not to mention how beautiful it would look at the foot of my bed. Love the slippers, throw and robe. I would love to win all 3 or at least 1 of them. Such pretty products!! I would love to slip into the plush slippers and relax under that plush throw. They look so comfortable!! I adore the 3-pc. Camilla patchwork quilt! I like it all, but the Camilla set is my favorite!! Everything is gorgeous.. I love the plush throws.. Beautiful colors !!! I love the slippers and bathrobe. They look luxurious! The patchwork is lovely but my fave is the woven jaquard look for Juliette….so gorgeous!!! The first one is beautiful! All pretty but love the quilt look and soft colors. Love, love, love the Camilla collection!!! I love the jacquard look of Juliette, it’s so elegant! And the Camilla quilt — so gorgeous! It’s too hard to choose just one favorite! Beautiful bedding!!! I could use that. Oh…and the slippers look soo yummy!! Oh my…..all of these would look wonderful in my bedroom……….but you got me with the jacquard one. It is just beautiful and would be wonderful to snuggle under. While everything is out of this world gorgeous, I can only imagine how luxurious it would feel to cozy up under one of the quilt/throws shown in the next to the last picture. I especially like the green one. It speaks of harmony and peace and comfort. The slippers and throw look warm and cozy. I love the Camilla bedspread! Love the print and colors! Everything is so beautiful, but if I have to choose one thing it would be the throw. Can’t wait to see your show. I love the blue comforter set (the 3rd photo). Gorgeous! I’m sure your collections will sell out. All of them are so pretty-matching the AG color family. You sure thought of everything to help us pamper ourselves. Your Amelie Photo Album came today. This is so fun- I took it out of the box and had so much fun mixing and matching the cards. I hope you’ll have refill pocket cards to go inside your refill set of pockets. I love all of these beautiful bedsets! These are gorgeous! My favorite would have to be the Camilla set. So elegant and it would dress up my room so much. Thank you Anna! I have the robe coming now! And plan to get the blanket. Love everything though! Love the gray Camila collection. Such pretty bedding! I too love the gray bedding set. I think it would look just perfect in my bedroom! Thank you Anna for all of the beautiful home décor and craft items that you design. I absolutely love the new Juliette collection! Will be watching! Oh, my, Anna-goodness! I would certainly enjoy those plush slippers because whether I’m folding laundry or creating a greeting card, I would still feel snug ‘N cozy like I never had to leave the plush Anna-blanket and comortem on my bed! The slippers and throw are so beautiful and I’m sure they are super soft. I’d love to give those as a gift. The Camilla comforter set is my favorite, but its all beautiful. Everything is just gorgeous. I especially like the patchwork quilt. The colors are beautiful. I love the patchwork quilt! Oh, so pretty!! How cuddly cute! Thanks for bringing us such gorgeous products! 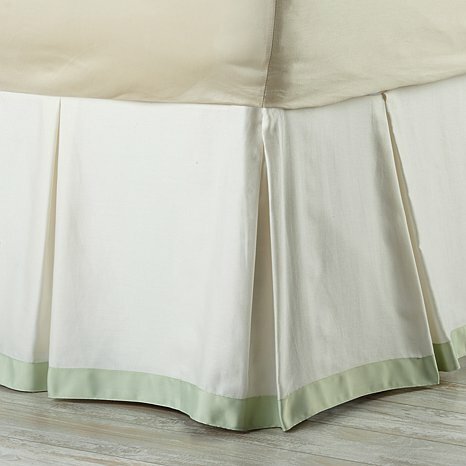 My choice for favorite new item would be the grosgrain ribbon bedskirt….yes, the bedskirt! I love the way it’s pleated and the (sage) ribbon trim is a beautiful accent. The bedskirt I now have is so scruffy and doesn’t go with my current duvet cover. I desperately need a new one. I also like the (sage) plush robe and slippers….but wish they came in pink! I love the hexagon patchwork quilt! I believe that is Camilla the colors would match my room perfectly. The throw in green is also very nice. So many beautiful items. The paisley pattern is still one of my favorites and I have used it many times in my crafting. I find all the patterns to be comforting and peaceful, full of beauty, restful to the eye. Grace is my all-time favorite room decor, but I would be so thrilled with any of the other collections to enhance it. My favorite is the Camilla comforter set and patchwork quilt. 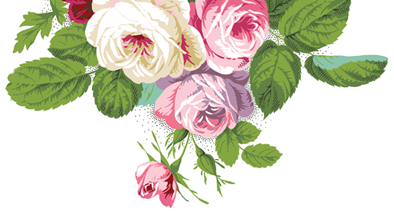 They would perk up and beautify any room…especially mine. Everything is beautiful. I think my pick is the Camilla set. The Camilla set is grand. Love it. I love the Camilla collection. I also like the robe, slippers and throw. Thanks for the chance to win these beautiful items. Oh Anna! I’ve been eyeing your beautiful home products! Love them all! We need a comforter and my fave is Juliette gray and the one in traditional Anna colors of cream and gold I saw on the web. The throw and slippers are perfect for everyone! Thx for making our lives beautiful!! Wow! All of the bedding is gorgeous but I would really love to have one of those comfy throws!!! They look so plush, warm and comfy! I would live the Juliette comforter set. It even matches the embossing follder storage boxes in my craft room! I really like the plush throw, robe and slippers. I love the soft colors. The bedding and home décor looks very soft and warm. The Juliette set is a masterpiece! It’s the most stunning thing that you’ve ever created. See you tomorrow! The throw and slippers look so cozy comfy! I am waiting for that too. Unfortunately I put off buying it the last time you had it. I love the Juliette, and I would love to have the blanket, it looks so soft, warm and comfy. Don’t you ever strop! I like the robe and slippers best of all. Got your Christmas Pop Up cards and they are beautiful. Keep thinking of new ideas for us and Thank you for everything. I’m loving that throw and slipper set as a gift and for me, the blanket. I love the Juliette (gray), but I would not say no to the robe and slippers and throw. Great Job, Anna. My fav is the Camilla bedding set. So unique and beautiful! Thank you for making so many great products and for a chance to win! Like your new patch print, what caught my eye was the well done bed skirt & of course the comfy robe. I love the Camilla patchwork quilt. It’s going to start getting mighty cold here in Colorado, and would love to snuggle under, this beautiful homey quilt. I hope I said the right one, the pattern is Octagonal. I love the Juliette bedding (grey)! I also like the idea of the robe and slippers. You always make it so hard to pick just one! Loving the Camila collection and everything else of course! I absolutely love the jaquard quilt and the blanket… based off of the colors of the blankets, I hope it is coming in a taupe or beige color!!!! I need it!!!! All your things are so nice, but I’m really loving on the patchwork quilt! The chic sets for the bed are so beautiful. My favorite is camilla. I will be watching Wednesday. Anna, when do you rest? I would love to have your energy also. Thank you for your beautiful products. I absolutely love the Bedding and the gray is stunning. It looks so rich. The slippers look great too I wear slippers around the house and the Anna Griffin ones look nice and comfy. I love the robe and the throw and slippers. They will make wonderful Christmas Gifts and I will have to make sure I include myself as well!!! Your comforts sets and accessories are absolutely beautiful Anna. Everything is positively gorgeous so it’s hard to pick a favorite. I am very partial to quilts and yours is the best therefore I will have to say that my absolute favorite is the patchwork quilt for Camilla. That said I must also let you know that I love the birds in the Juliette collection so I love the woven jacquard comforter. I also could use a new robe and slippers and I will never find ones nicer than yours. Congratulation on your new line. Here’s to a great show. Would love to win this for me or my daughter. We both are always cold and this looks like it would keep you warm. Wonderful items as always! No way to choose any one of these products. Everything looks just beautiful but I think the Camilla quilt is my favorite! You always amaze me Anna! I love the robe and matching slippers! Wow, it all looks so luxurious and so comfy. Very elegant and so very Anna!! Beautiful crafts, beautiful home decor from a beautiful woman. Thanks for sharing all that you are Anna! The quilt sets are lovely, as well as the decorative accessories I love beautiful bedding!!! And yours are outstanding ! Hi Miss Anna and team! Absolutely gorgeous…..everything! It would be so difficult to choose just one! That being said, I have had a crush on the Juliet collection since you first debuted it on QVC UK. Love it and everything else as well! those blankets look so luxurious!! So hard to choose a favorite. I would have to say the patchwork quilt. Safe travels Anna! 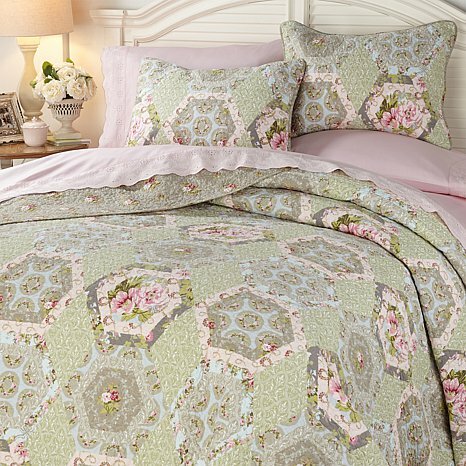 The Juliette 3-piece comforter set looks beautiful. I’m so excited, I just purchased it and the throw and slipper set. I can’t wait to receive my order! Love quilts and your new line is lovely. Keep em coming Anna. Best wishes, Bonnie W.
LOVE all of it such beauty and elegance. Thanks for the preview and look forward to shopping. LOVE the new lounge wear. 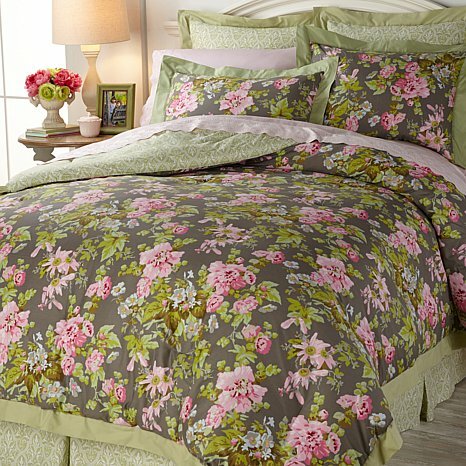 I love the Juliette comforter set! I’ve been needing a new bathrobe but I waited. I’m so glad I did! I can’t wait to get one. And the throws and slippers are gorgeous!!! Unfortunately, my old bathrobe has expired! I would love, love, love to have your new robe! Cozy! I love it all, but my favorite is the Camilla comforter set. It is all so gorgeous!! Oh my gosh!!!! I’m way excited! It’s so hard to pick , they’re all just beautiful with amazing patterns and high quality! I’ll be watching and hope to receive one or many items. Thank you to you and your creative and talented team. I love the patchwork quilt and the robe and slippers. They are totally me. As always, everything is just beautiful. I bought the lovely cosy Amelie set on QVC and wondered if there is going to be a baseValance to match available and also an extra set of pillowcases ? So hard to choose only one, but the slippers would be perfect after a long day of work. I love the plush blanket, throw and slippers and the robe! They look so soft and cozy! The Juliette set is beautiful. These are all so beautiful! If you make me pick a favorite, I think the throw and slippers would be mine because I can imagine crafting on a cold winter’s night with those slippers on my feet and the throw on my lap. The think the Camilla comforter is absolutely exquiste. Everything looks so soft and elegant. I’m really involved in intensive “Cricut YouTube classes” and pop-up Christmas card-making this week, Anna, thanks to you, and enjoying it all! Your new home goods are as gorgeous as your designs always are, and I think the little touches of robe and slippers and a neck roll make it all so luxurious. After a long but exhilarating day of watching my Golden Cricut drawing and cutting beautiful designs and Mincing selected cuts, I envision myself reclining on Anna’s 3 piece Camilla Hexagon Patchwork Quilt as I wear Anna’s plush robe (taupe) and I sip a cup of green tea. Love the robe, looks so comfy! I love so many of this new group of Anna Griffin linens. There are the decorative pillows–the Camella Pair, the Camella Wreath, and the Gray Jacquard Julliette Pair (with a matching Gray Juliette Comforter Set). I love grosgrain ribbon and the colors of gray and wheat in the Anna Griffin line; so I also admire the Grosgrain Ribbon Euro Shams and the Plush Printed Blanket. 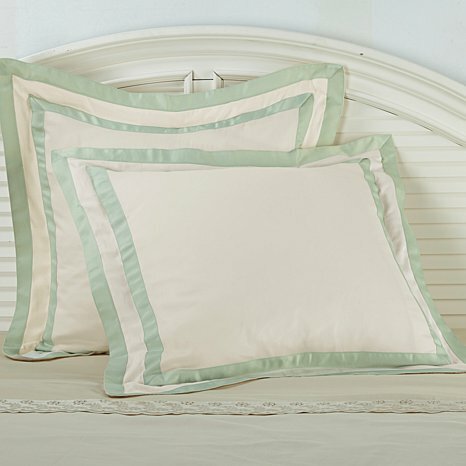 These all work with linens I own from this line and others. I absolutely love the 3 piece gray jacquard set. All are beautiful, but this one really strikes my fancy! I love the Camilla bedding! I just love everything, but the wreath pillow, stole my heart! Love the throw and slippers. LOVE the robe! It is beautiful. I live in robes after I get home from work. To have one plush and beautiful would be divine for weekend wearing. Love the robe!! Now that little darling looks so toasty and comfy, PERFECT for these LONG , COLD Northern Wisconsin winters!! Just beautiful Anna!! LOVE the color! The slippers and throw look so soft! Everything is Anna-gorgeous, of course! Thank you for the chance to win and have a fantastic day! All your home products are beautiful! Love the throws and the robes with matching slippers. I love the plush throws, slippers, & the robe especially in the grey! I sure could use a new robe and slippers. Everything is so beautiful. How to choose! Slippers and throw looks so cozy. Juliette bedding, and those pillows! Love the silvery gray too. LOVE THE SLIPPERS AND ROBE!!!! Oh it’s so hard to choose just one but I think the robe looks so crazy & warm! Then of course I would need the slippers & throw to top it off! I love them all. Baby Gift” for the new mother to enjoy. My favorite is plush throws, slippers and robes. 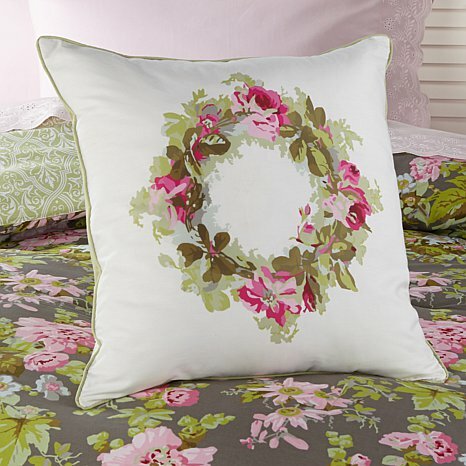 The Camilla comforter is SOO Anna Griffin–beautiful. Also like the throw and of course the robe. I would love to decorate my whole house in Anna Griffin style. I love the soft colors and a quilt would be my choice. The patterns are so nice. ANNA, EVERYTHING YOU MAKE IS SIMPLY ELEGANT BUT I AM IN LOVE WITH YOUR SLIPPERS AND MATCHING THROW. I’M A MOM AND CAREGIVER TO MY DISABLED LITTLE BOY SO I LOVE THOSE LITTLE LUXURIES TO KEEP ME GOING. Oh, the slippers and throw. What a delight! The Jacquard bed set is beautiful. However, I am going to be selfish and choose the throw and slippers as the item I would want. They look comfy and pretty too. The comforter set for Camilla is BEAUTIFUL! and the matching pillows and draperies??? YES!!! Woven jacquard Juliette bedding. Beautiful. The patchwork quilt is absolutely stunning!! Anna, everything is SOOO lovely! I do like the robe and slippers…it feels cozy already…just looking at the photo of the model wearing the robe!! Thanks again for creating such interesting products for us. Oh! Definitely the blanket!! What a beautiful way to finish off the bedding ensemble! The robe, slippers and throw are calling out to me. They look so luxurious. Pampering at its best! I love all of your linens but my all time favorite would be the Grace Reversible Comforter Set in the black. I have some of your craft storage boxes in that pattern and I just love them. Thank you Anna for wonderful products. Just been working on pop cards. Second attempt better. Sorry this was your last time on Qvc. You deserved a better send off so thank you on behalf of all British craters. Please join another crafting channel. Love M.
Love the robe and slippers. I also love the Camilla quilt! I love the Camilla set ! It’s gorgeous. My favorite of all is the Camilla wreath pillow. Would love to see that on a card too !!! Your gorgeous Camilla sets are my most favorite. I love this print so much! Have fun at the shows tomorrow Anna! I am looking forward to watching these new home decor items. The brown bedding set is fantastic. It has my most favorite of all Anna Griffin flowers on it. Wow, what beautiful bedding. Who wouldn’t love to have a pair of those cozy slippers and the matching blanket? I know I would! It’s all so beautiful. I really love the look of the patchwork quilt. It would be amazing to have a beautiful bed set with matching curtains. The robe and slippers look so soft and warm. Already got the plush throw! Love love love it! Love the patchwork quilt! 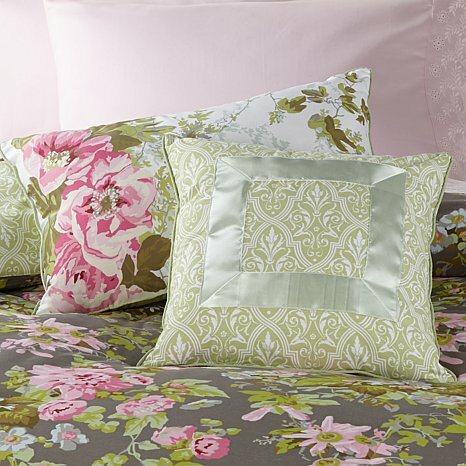 All of the bedding sets are beautiful, but the Camilla sets are my favorites. I love the robe, slippers, and throw. I can just imagine wrapping their beautiful softness around me! Love the tailored bed skirt. Hello Anna, I went wild at the last HSN craft show of your new products. I especially like the Camila patchwork quilt and comforter in your new bedding line. Very pretty. The patchwork quilt and comforter set for Camilla is absolutely beautiful! The lounge wear and cozy comforter are my faves. The throw and slipper set is awesome, but I also like the blankets with the satin edging !!!!! My favorite is the Patchwork Camilla, it is beautiful! I love the woven jacquard look for Juliette. It look so elegant yet comfortable. The blankets are so pretty! I have so many blankets in my house. Can’t wait to buy one. Love the patchwork quilt. Beautiful. I’m a slipper girl. They look so soft. Can’t wait to snuggle up with slippers and throw . I love the Camilla patchwork set…but everything is exquisite—it’s difficult to decide! Anna, all so beautiful. I love the patchwork quilt. I love the quilt — but the Midwest me just wants to cuddle in the throw and keep my toes warm in the slippers. It is all beauty in the making. Love that gorgeous brown comforter with the Roses!! Oh my goodness that is sooo pretty! LOVE the Juliette 3-piece Gray Jacquard Comforter Set and the cozy looking printed plush throws !!!! Everything looks Wonderful !!! Wishing you GREAT shows and many sell outs !!! Hi Anna, love the Camilla patchwork set, so beautiful. The slippers and throw look to be so soft and comfy. Everything is gorgeous, my favorite is the throw with slippers, great gift! Pillows! I have the grace bedding and curtains and I also ordered the slippers and blanket to keep me cozy. I love the bedskirt and decorative pillows. Everything looks stylish yet comfortable. The robe and slipper set look so luxurious! My favorite part of the day is a lovely cuppa in the morning catching my breath before my day begins. I think I would look lovely and feel warm and cozy in that beautiful set. Anna, you make such beautiful things, more than just cards/stationary however these items are just gorgeous. My favorite is the Juliette comforter. It is just beautiful. Have a great day showing all of it. The linens are of course beautiful! My favorite would be the robe and slippers. As winter approaches, it would be such a lovely treat to cozy up by the fire and make my AG Christmas cards. Sending a set to my daughter in college so she can cozy up in her dorm to do her engineering homework which never ends. I like the throw and slipper set. Perfect for curling up on the sofa. Warm body, warm feet…..how comfy is that? Those slippers are calling my name! I love the tailored, bordered accent pillows! Just the right elegant touch to finish off bedroom decor. Thanks Anna! I think the linens and everything looks so much like Anna. Very lovely! The robe and slippers look very comfortable. Beautiful! I LOVE the Camilla comforter set. I already have the black Grace comforter, but now I really want the Camilla one. It’s beautiful!! The satin comforter looks amazing! I love the Camilla cotton decorative pillow pair. They will look perfect with my Camilla quilt kit I purchased a while back. Your patchwork Camilla quilt is my favorite. All your patterns are lovely. Looking forward to your shows! All the home items are simy beautiful!! I love the robes and throw and slippers that match. They look so soft and comfortable. What wonderful products!!!! Wow the Joliet bedding is exquisite! Luxury written all over that with the pillow with the white trim. Beautiful. I love how you have used your designs & put them into bedding & home items. I could use the jacquard comforter/bedspread and shams in a new bedroom needing decorating! Beautiful selection!